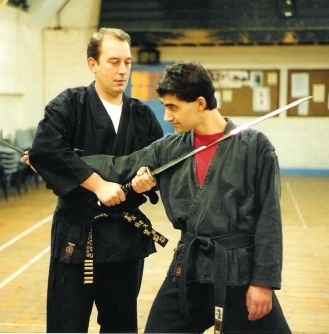 Iga-Ryu Ninpo Ninjutsu offers classes for all ages, from children age 10 to 15 and adults aged 16 and above. Our schools are a great place where you can spend time with friends who share your commitment to learn Ninjutsu. Adults are taught Traditional Ninjutsu where you will learn realistic self-defense techniques that help you deal with stress and threat situations (armed and unarmed). They will also learn to use traditional Ninjutsu Weapons (Sword, Tanto, Handbo etc). Children will learn traditional and modern Ninjutsu techniques (including Sword, Tanto, Handbo). All children's weapons are specially designed, safety foam coated plastic. Ninjutsu will keep them physically fit and healthy, basic meditation will help develop their concentration and most importantly a strong spirit to help them deal with bullies without fighting. The training will not just keep you physically fit and healthy, but mentally as well with our meditation sessions. I teach in a very calm and relaxed way and instill confidence in all who train with me. Class sizes range between 10 and 30 students. Ages range from 10 to 60+ and we have both male and female students. All Black Belts were once beginners and are all very approachable. They do not have huge egos and swagger around the dojo. They are the same as you and I. There is very little formality, you only have to bow to the instructor at the start and end of each lesson. During the rest of the lesson we are all on first name terms apart from children who always address the instructor and other black belts as Sensei. Each class is different and everyone is equal regardless of grade. We change training partners often during the lesson. This gives you a chance to meet people, train with some of the more experienced students & essentially get personal tuition from one of the higher grades if you wish. Inside the dojo (training area) we train on a hard floor and you will be taught methods for falling safely onto it. However, this skill takes time to develop so you will not have to fall onto the floor until you feel you are ready for it. There are training lessons outside on grass which are ideal to practice falling on. Class Format During the lesson you will: Learn breathing techniques, Warm up, stretching to avoid injury & build flexibility How to fall and return to your feet safely How to minimise injury when struck or locked. You will also learn about, punching, hand strikes, kicking, blocking, locks, throws & nerve strikes. Each class is different, but will cover some of the following: Defense from a wide variety of strikes including, escapes from chokes and holds, the use of any area of your body to strike, more advanced locks, chokes, throws, grips etc. The ability to fall safely on hard surfaces, leaping & rolls, balance breaking, the use of distance and space (working in close quarters and at longer distances.) Dealing with multiple opponents. You will also learn the use of various weapons.